All-Weather Rattan is furniture that can be left outdoors, all year round. It can be left uncovered, even throughout Winter. 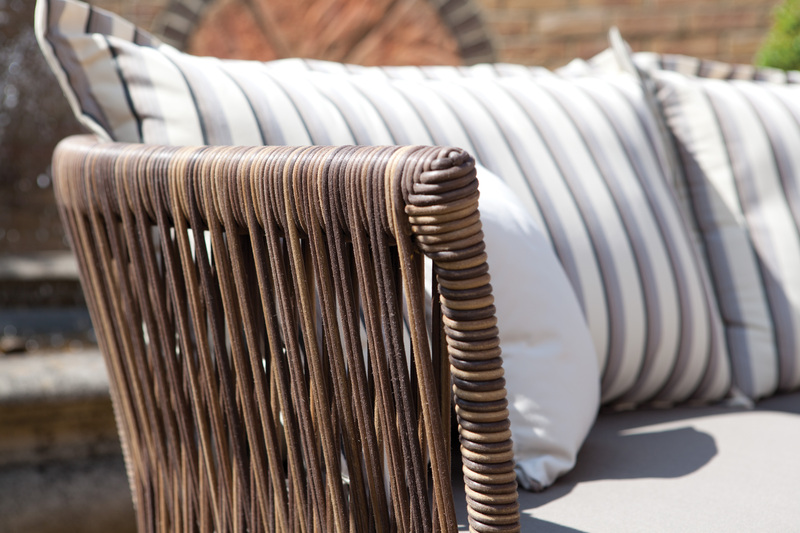 Our All-Weather furniture is made using Tissé® woven synthetic fibre. The fibre is polythene based, UV resistant and heard wearing which means that you really can leave it outdoors - all year round! As you can see from the picture on the right, the high-quality materials that we use give a beautiful, natural finish. It could easily be mistaken for a natural rattan! The woven fibre is hand welded to aluminium powder coated frames which produces surprisingly light-weight furniture. The cushions we use, are manufactured in the UK and made from a water resistant material. Due to the sewing process, we reccomend that cushions are brought in after the summer to prevent water getting into the foam. We are so confirdent in the quality of our product that we offer a 5 year guarante on all outdoor furniture.